The story opens with a vivid description of Beria’s NKVD men replacing the SS in the wake of Zhukov’s race across eastern Europe and into Germany: the one quite as bad as, perhaps even worse than, the other. General Dimitrov, a Georgian like Beria (and Stalin) has spotted someone he thinks might be useful among the SS men they are executing en masse (no POWs here!) – an SS Obersturmbannfuhrer and marksman named Franz Mueller, who is also a US citizen. Dimitrov tests his commitment by setting him to shoot two dozen of his erstwhile SS comrades and, that done, recruits him and sends him off to Washington to live quietly and await orders – just another one of Beria’s countless moles spread out around the world. Meanwhile, a disgruntled Churchill (having lost the UK election to Atlee, who is, in Churchill’s view, soft on “Good old Uncle Jo” Stalin) has received an invitation to receive an honorary doctorate and make a speech at a minor American university in President Truman’s home state. Believing as he does that Stalin and his cohorts represent quite as great a threat to peace and freedom as Hitler ever did – though very few people agree with him – Churchill decides to sieze the opportunity of a widely publicised event (Truman will be there on the platform with him) to warn the world about Stalin and communism as he once warned them about Hitler and nazism. He composes one of his most famous speeches – it is the speech in which he introduces the phrase “the Iron Curtain” to posterity – but it is all to be kept under wraps until it is delivered. He does not want the Russians upset and Truman embarrassed in advance (Truman and Stalin are still oficially allies). 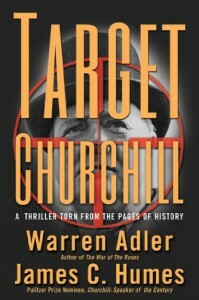 However, the First Secretary at the British Embassy in Washington (the man who runs the show) is a certain Donald Maclean (click on the name if it doesn’t ring a bell) and Maclean arranges matters so that his master in Moscow (Beria) receives a copy of the speech long enough in advance for the mole (now Frank Miller) to be activated: Target – Churchill. I have probably given away more of the plot than I should, but it doesn’t matter, you can get all this and more from the blurb and the many reviews around. What matters is the detail, especially the bringing to life of Churchill as he was in 1946, immediately after the end of the war. Revered throughout the world (where he wasn’t reviled) yet rejected in his own country and out of power, but certainly not impotent, for the pen is mightier than the sword and a great wordsmith (“the greatest wordsmith of the century”) could still compose speeches that would alter history. Which was why, in the view of the Russians, he had to be silenced.